i’ve been thinking about perpetuity and continuity. you always have to strive to live healthier, be happier, work harder. it’s hard because there’s no one and done’s; no peace out, i’m finished. unless you’re retired and don’t have to deal with the workforce ever again and spend your days cool as a cucumber, golfing and playing ukelele and nurturing your e-bay selling habit (hi, dad). and it’s annoying in some instances, but also great for second chances. haven’t worked out in a month? it’s okay, walk instead of drive when you go out for ice cream. eat too many cookies today? you can scoop yourself a serving of swiss chard and sweet potato gratin tomorrow. which makes it sound like i’m only into this for the health benefits, when really this gratin is just the free vegetable hug (sometimes there are people who have signs and offer free hugs on campus though they do not offer free vegetables, unfortunately) you need. if you have wilty greens waiting to be used and you don’t like the taste of them (ie beet greens like the ones photographed here), this is the perfect destination. you don’t get that spinach-y, iron-y aftertaste, and they get suitably buried under the creamy sweet potatoes and melty, golden cheese. 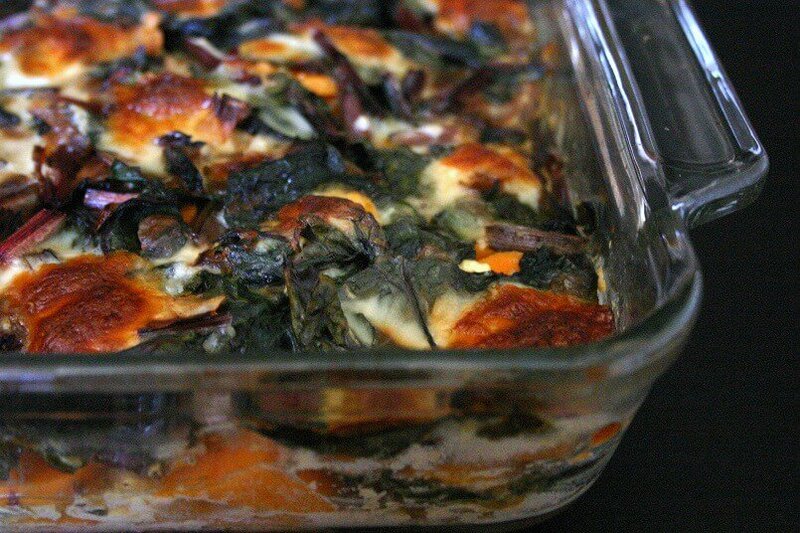 this swiss chard and sweet potato gratin is super comforting and cozy, no matter if you’re in blizzard town or in the midst of finals. 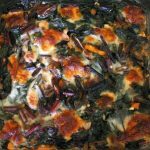 This swiss chard and sweet potato gratin is filled with vegetables and cheese, making it a perfectly hearty vegetarian entree worthy for any meal. Cook onion in 1 T butter in a pot over moderately low heat, stirring, until softened. Add chard stems and nutmeg; cook, stirring, until vegetables are tender, about 8 minutes. Increase the heat and add the leaves in large handfuls, stirring, until all of the greens are wilted. Season with salt. Transfer the greens to a colander and press out liquid. Simmer milk and garlic in small saucepan; keep warm. Melt 1 T butter over moderate heat and stir in flour. Cook, whisking, for 1 minute, then slowly whisk in milk and boil, whisking, 1 minute. Season with salt. Spread half of potatoes in a greased 8x8" baking dish. Sprinkle with some of the herbs and cheese. Distribute half of greens over cheese, then more herbs and cheese over it. Pour half of sauce over then continue with remaining sweet potatoes, herbs, cheese and then greens and herbs. Pour remaining sauce over, pressing vegetables slightly to submerge. Sprinkle with remaining cheese. Bake at 400F for 1 hour until golden and bubbly, and most of the liquid is absorbed. Let stand 10 minutes before serving. You can sub in 1 tsp dried thyme in place of the fresh thyme. You can sub in other cheeses, but pick something flavorful. the real question is, what kind of cookies? 😉 and i feel you on that golden melty cheese; i’m convinced it makes everything better. Sounds deliciously comforting! I love both swiss chard and sweet potato so the two together sounds divine! Plus, with cheese on top? How can you go wrong 🙂 ? It’s the first day of spring, but totally snowing here so this would be perfect right about now! Ummmmm I really need a vegetable hug right now! This looks and sounds so phenomenal I can’t even stand it. Sweet potatoes are one of my favorite things adding cheese and some greens? Yeah, this is gonna happen soon. As much as I would LOVE to retire and just stay-cation it for the rest of my life, I feel like I would get bored. If we aren’t striving towards something, whether it be a personal or professional goal, what are we here for? Ya know? But I’m also a type A personality with a moderate to severe case of OCD. Sooo? 😉 Anyways, LOVE this gratin! Seriously, potato gratins are my weakness, so this cheesy, swiss chardy goodness is SCREAMING my name! Cheers, girl! at the moment i’d love to say that i’m ready to do nothing for the forseeable future, but i think it’s a grass is always greener on the other side (it’s finals week so everyone is stressed and sleep deprived and in crisis mode) deal. i’d be so bored and restless. (i’m also a type a who love lists and research lol). Oh man, this sounds so so good. Perfect dish for today – I do love sweet potatoes and chard is one of my fave greens for cooking, too! Thanks for the recipe, I will Pin it. 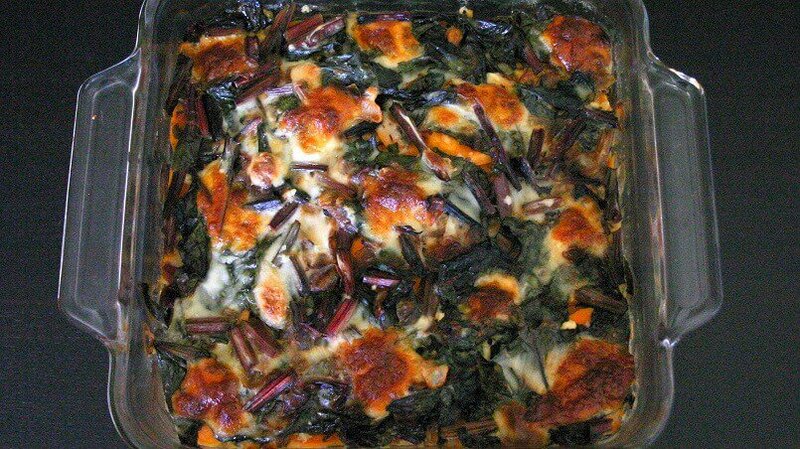 swiss chard is so tasty, no matter if it’s just sauteed with a bit of garlic or put into something a bit more involved like this gratin. i love how sweet and tender the stems get! EVERYTHING and I mean EVERYTHING is better with sweet potatoes. SERIOUSLY! I love those suckers SO SO SO SO SO much! good thing third chances are a thing, too (: thanks, kelly! Yumm! I love enjoying sweet potatoes in a savory way and this looks perfect! This looks amazing! I love how sweet potatoes can go sweet or savory!!! I’d love goat cheese with this!! oooh goat cheese would be amazing! any cheese works, though i prefer something stronger than mozzarella, and goat cheese definitely falls in that category. in the one photographed here, i used a mix of feta, parm and mozzarella, which was (shocking, i know; when is cheese not tasty?!) pretty delicious. We need to always strive to better ourselves and just keep going! Great reminder, Heather! Sweet potatoes and Swiss chard sound so amazing together with the cheese! It looks so delicious and filling! I just stuffed my face with a massive piece of sheet cake, but no apologies here! I often have soft Spinach and Kale in my fridge. Like the idea of using wilty greens in this Gratin form. mmmm sheet cake is so worth it though! (: and wilty greens would definitely be good here; it gets all tender and cheesy, and how could that be bad?! OMG, how did you know I love swiss chard and sweet potatoes and Potato AuGratin is one of my favorite treats. It seems like this post is just for me so THANK YOU THANK YOU THANK YOU! not quite like potato au gratin (that’s a bit creamier and cheesier 😉 very delicious though, i agree), though tasty in its own way! also, you’re welcome!! I love swiss chard and love how creatively you used it here. I’d never have thought of that. I pretty much always have wilty greens in my fridge that need to be used. Now, I have the perfect recipe for them! Ooey, gooey cheesy goodness! Yum! Can’t wait to try this! ahh i love smitten kitchen!! if i could bake/cook with deb or ina garten or melissa clark, i’d be a happy camper. a free vegetable hug?!? count me in!! and I don’t use swiss chard enough (actually, let’s be honest – i’ve never used it..) so I feel like that needs to change! Yummy! I love this dish! I will definitely give it a try, Heather! thanks, agness! 🍠 (also, probably not surprising, but there’s no swiss chard emoji, lol). Veggie hugs are more than welcome here. Now that it’s warmer weather here I can only see more grilling and meats in my near future. Really need to figure out a balance. Isn’t it funny that no one really prepares you these feelings of life? Half the time I have no clue how people do it… almost every other day I feel like I can barely get by. haha. grilling intimidates me! i love the smoky flavor you get, but the lack of heat control makes me wary. i really should get more into it though, because using the oven during summer isn’t the most fun. You have an incredible way of making the healthiest of plates look delicious filling and mouthwatering, Heather. I can’t say that I would love to eat healthy every day but if my plates looked more like the ones you make I wouldn’t shy away from it whatsoever!